In this this month’s “What are you reading?” HoCoPoLitSo’s Board Member Kathy Larsen tells us about The Gentleman from Moscow by Amor Towels. 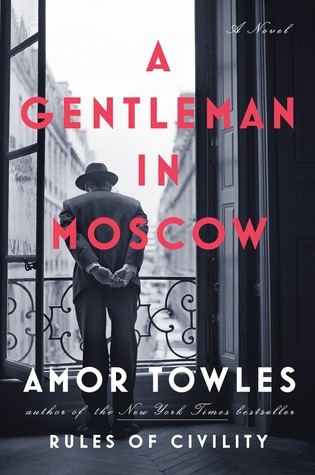 Although The Gentleman from Moscow by Amor Towles could be a quick read, it is so beautifully written that I chose to savor it. The novel opens in 1922 Moscow with an interrogation between Count Rostov and a Bolshevik charged with sending aristocrats to the firing squad. Expecting to die, the Count gives flippant answers. Asked if he had written a poem seen as a “call to action” prior to the Russian Revolution, the Count replies that the poem was attributed to him. Surprisingly, his life is spared. Instead, he is exiled to the Metropole Hotel and shifted from his suite above the Bolshoi to what used to be the servants’ quarters in the attic. With the interactions among these characters working and living in the hotel, the author builds a community of hope and friendship amidst a world of fear. The Count, always charming and always observant, befriends a small girl who teaches him the terrain of the hotel. He’s kept informed by the concierge stationed at the door and kept sane by the rooftop beekeeper. He is also challenged by his nemesis, a boorish waiter who becomes the Communist enforcer. Subtle changes in the Count’s situation reflect the changes in the greater Russian world during the 1920s and on. As Communism solidifies, the Count’s elitism and knowledge are discounted, even condemned. But when Stalin takes over and Russia returns to the world stage, the Count is asked to teach table manners to a potential ambassador. Despite the turmoil, the love that Russians have for their homeland vibrates through the novel. By Laura Yoo in WAYR Series on May 1, 2017 .